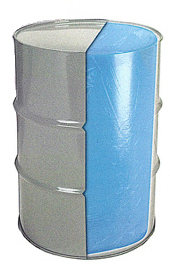 Blue Round Bottom Poly Drum Liners, Riverside Paper Co. Designed to recover 100% of bulk packed materials- TINTED BLUE FOR FOOD INDUSTRY. Used to hold light weight as well as extremely viscous products. Liners will insert easily into pails and drums due to the contoured shape of the liner.